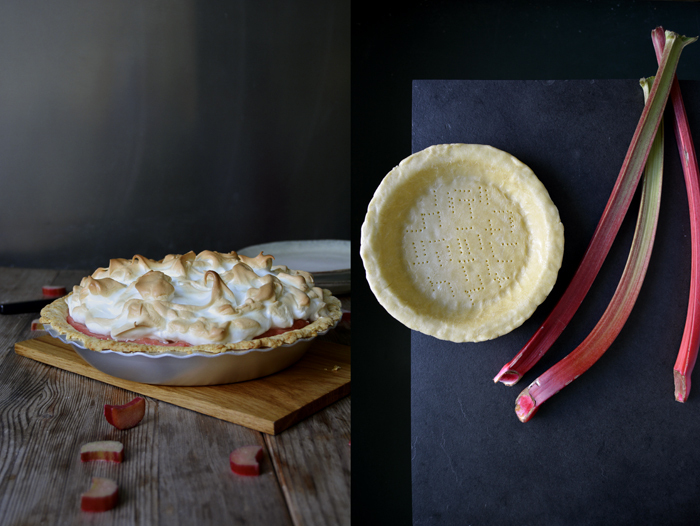 This has been my rhubarb week! I bought too many stalks for my rhubarb and leek gratin on Monday, their colourful beauty was just too tempting and I ended up grabbing (and buying) as much as I could fit in my hands. 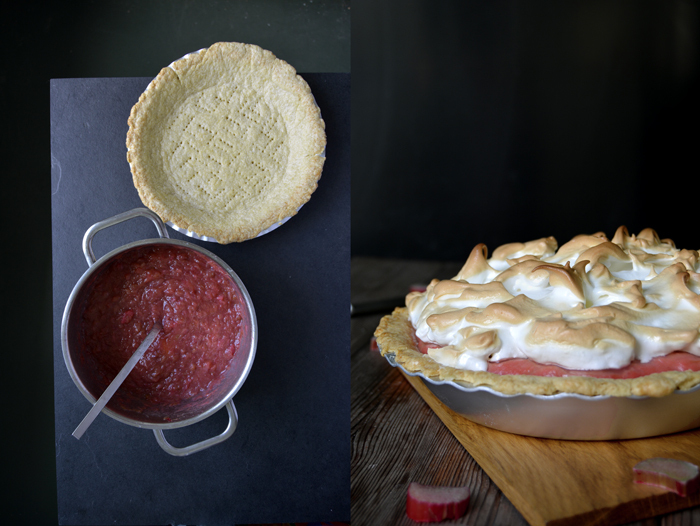 So the green and red pile on my marble top called for a compote, or even better, a pie! 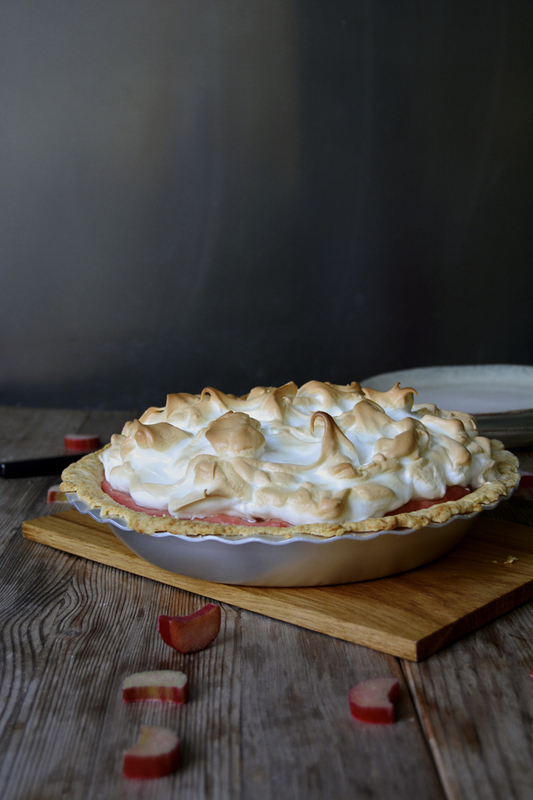 I felt inspired by Jenny’s fabulous lemon meringue pie, the recipe is from my sweet Maltese mama. I often praised the addictive qualities of my boyfriend’s mother’s sweet creation. This lady is also one of the biggest rhubarb fans I know, every time we visit her in Malta we have to take a few jars of compote to stock up her pantry. She just loves it! 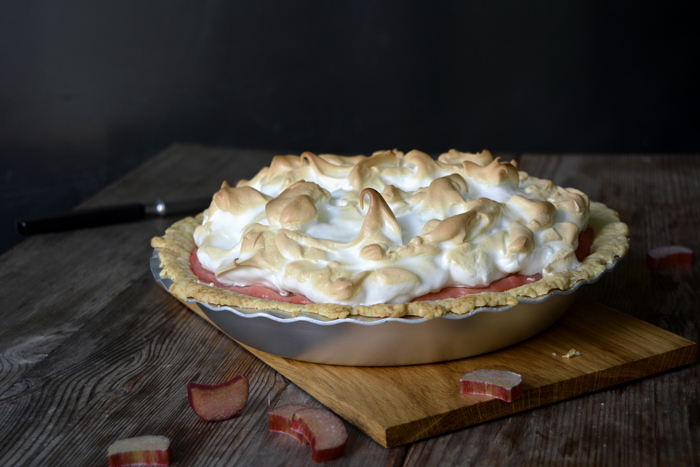 So I dedicate this dish to her: a wonderful pie made of a crumbly short crust, topped with the fruitiest, cinnamony rhubarb curd you can imagine, finished with a voluptuous layer of sweet meringue. 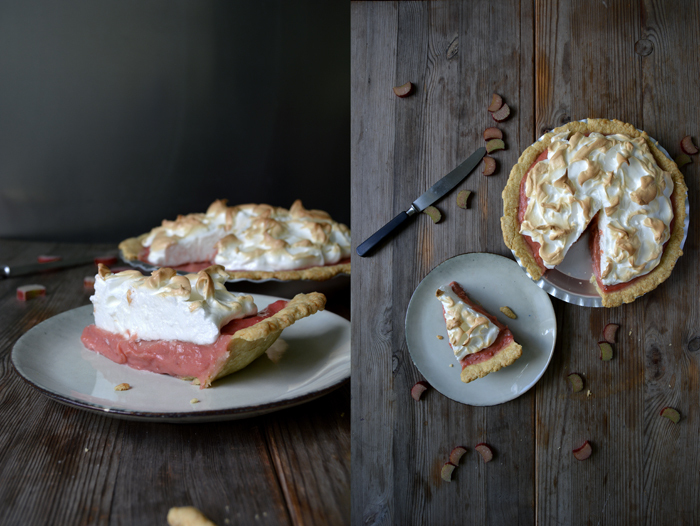 I like her lemony pie a lot but I learned that rhubarb lifts it onto another level, at least for my taste. It’s such a fruity, sour and slightly sweet and buttery composition. Next time we go to Malta, which will be soon, I decided that I have to make it for Jenny. She’ll be over the moon! A short note: The curd in the cool pie will be a bit more set than you see in the pictures, I cut it too early – guided by my impatient appetite! Combine the flour, sugar and salt in a bowl. Cut the butter with a knife into the flour until there are just little pieces of butter left. Continue with your fingers and rub the butter quickly into the flour until combined. Add the water and continue mixing with the hooks of an electric mixer until you have a crumbly mixture. Form a thick disc, wrap in cling film and put in the freezer for 15 minutes. Set the oven to 210°C / 410°F (top/ bottom heat). Roll out the dough between cling film and line your baking dish with the flat pastry. Prick it with a fork and blind-bake in the hot oven for 15 minutes or until golden. Let it cool completely. First you make a rhubarb compote which you then turn into a curd. For the compote, heat the rhubarb, 150g (3/4cups) of sugar, cinnamon and 1 tablespoon of water in a large pot on medium heat until the sugar dissolves. 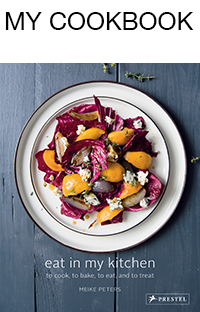 Turn up the heat to medium-high and cook for 10 minutes (open, without a lid). Take off the heat and stir in the butter. For the curd, whisk 75ml (1/3 cup) water, the cornstarch, 2 tablespoons of sugar and salt and add to the hot rhubarb. Bring to the boil and cook for 3 minutes on medium-high heat, stir once in a while. Take 1 tablespoon of this mixture and whisk into the beaten egg yolks, pour the egg-compote mixture back into the pot with the rhubarb. Bring to the boil, stir constantly and cook for half a minute. Take the pot off the heat, pour the curd into a bowl and let it cool completely. You could place the bowl on cooling pads to speed up the process. Beat the egg whites with the salt, adding the sugar gradually while beating, until the white is stiff. 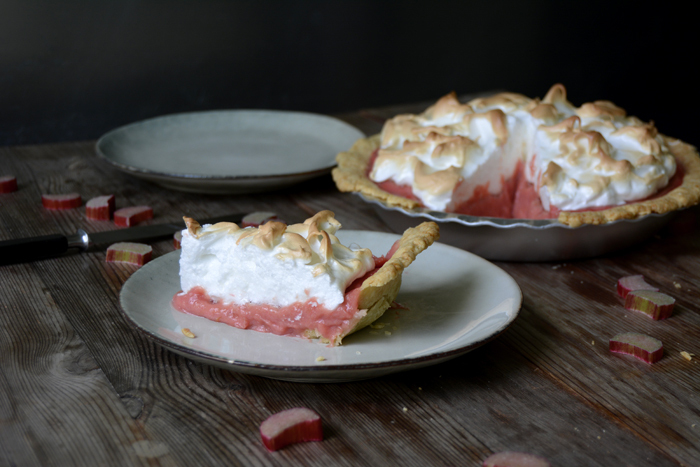 Pour the cool rhubarb curd on top of the pastry and finish it off with the stiff egg whites, you can form little peaks with a knife to create an uneven surface. Bake for 7 minutes or until the top is golden brown and crisp. Let it sit for about 30 minutes before cutting for the curd to set. The pie still tastes great the next day (after keeping it in the fridge) but it won’t look as pretty. The taste was incredible, but it didn’t set at all. Will try another time with some more cornstarch? 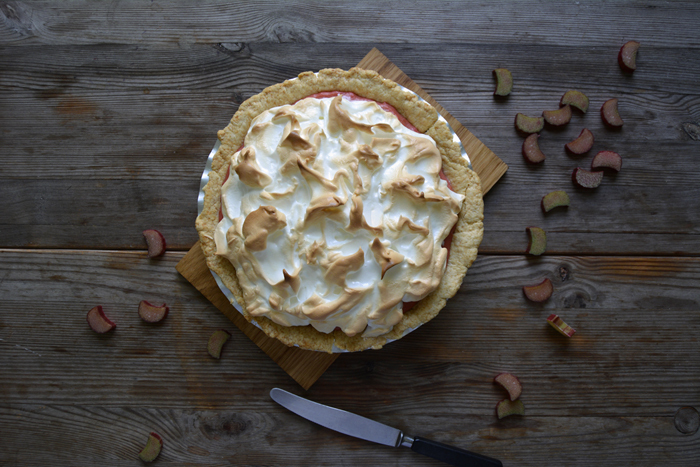 Hi Suzanne, I’m glad to hear that you had a great night and enjoyed the pie’s taste! How long did the pie sit before you cut it? Did it look similar to the pictures in this post or was it more liquid? I cut the first piece after about 20 minutes (which you see in the pictures), I cut a second piece after an hour and then the curd was set, not stiff, but set. I always try to keep the amount of cornstarch to a minimum but you could try it with a little more. Tried the chutney last spring :D. Tasty gift for my family. And we had a wonderful night, thank you!